Wired has a feature on “Better drinking through chemistry”. This includes a recipe for Eben Freeman’s jellied gin and tonic. This was made for Herve This’ molecular mixology masterclas held at the Ritz in Paris (hosted by Bols, more links here). I found the picture below a long time ago at Drink boy and though it was really cool, but I didn’t quite figure out how it was done. Until now! Enjoy the picture and the recipe. Freeze lime and cut into chips with deli slicer. Coat slices in simple syrup and 1 tsp. citric acid; bake at 150 degrees until crisp. Mix bicarbonate of soda, sugar, and remaining citric acid. Soften sheet gelatin in cold water for two minutes. Warm gin and add gelatin. Pour into a shallow baking pan lined with plastic wrap, add tonic, and refrigerate for two hours. Cut into 1â„2-inch cubes. 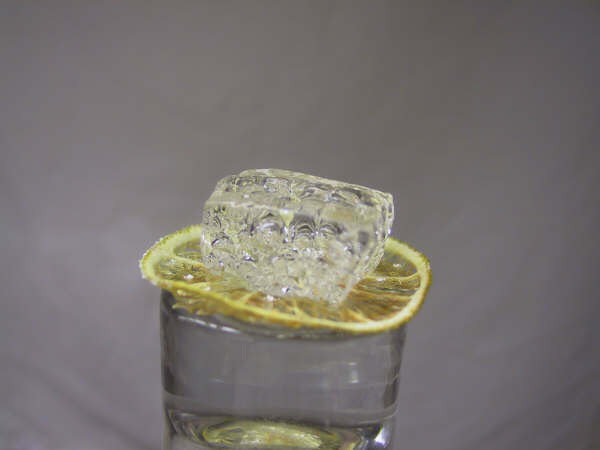 Put cube onto lime chip, sprinkle on sugar-soda-acid mixture (the acid combines with the baking soda for a carbonated feeling on the tongue), and serve. « Previous: IgNoble prize for food chemistry! Did Eben share the recipe with you? Check the first link in the post (to Wired’s feature on “Better drinking through chemistry”)- there you’ll find this recipe and others.